The color of buckwheat flour has tinges of gray, so when you're mixing the flours with the wet ingredients, your bowl appears to be filled with asphalt instead of batter. It's sort of beautiful in that way and made me think of all those initials and dates you see etched into the sidewalk where people waited patiently for the asphalt to dry just enough before they could carve their name into the road with a stick. These waffles make an exceptional breakfast. With little sugar (only a tablespoon of honey) and only whole wheat flours, you're in for a healthy morning. One of the problems with traditional pancakes and waffles made with white flour is they are don't sustain me and less than an hour after finishing my meal, I'm usually hungry. And when I'm hungry, I'm cranky, so you can see how this is just a downward spiral, but these waffles have enough fiber and other goodies to keep me full for several hours. The recipe comes from Ellie Krieger, someone who I've been returning to lately for inspired healthy cooking ideas. I like her philosophy. As a dietician, she could easily be rigid about certain foods and ingredients, but instead has a "no guilt" mindset. That doesn't mean you should eat ice cream every day, but it does mean that when you have a slice of cake at your friend's birthday party, there's no sense in feeling bad about it. The recipe is for blueberry pancakes (which I've made for weeks now to keep frozen for weekday morning breakfasts), but this time I wanted to try waffles instead. If you don't have buttermilk, simply add 1 tablespoon white vinegar to 1 cup milk and let stand 5 to 10 minutes. In a medium bowl whisk together the flours, baking powder, baking soda and salt. In a large bowl whisk together the buttermilk, milk, honey, eggs and oil. Pour the dry ingredients into the wet and mix to combine. 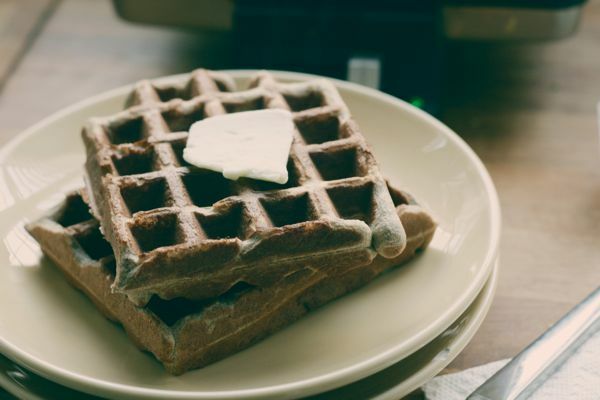 Preheat a waffle iron to desired temperature. Pour about 1/2 cup batter into each pan and cook according to manufacturers instructions. Serve hot with butter and maple syrup.